In 1980s suburban America, heavy metal was king. Or at least a certain kind of heavy metal. The music in question was often dismissively referred to as hair metal or glam metal even by other, more serious headbangers, but while commercial sounding hard rock bands of the era like Bon Jovi, Def Leppard, and Poison may not have been taken seriously, they were laughing all the way to the bank. Having a pretty killer party on the way there, too. That all ended in the early nineties when alternative rock became the new "in" thing, but nostalgia has a funny way of bringing things back. 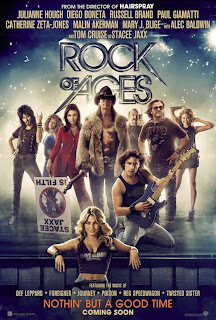 And as is the case with the new film ROCK OF AGES, it can sometimes bring them back in funny ways. Back in the 80s, if you had suggested that one day there would be a hit Broadway musical made from hair metal's biggest hits, you would have been laughed out of the room. Well, it happened, and now that musical has been turned into a movie. Sherrie (Julianne Hough) and Drew (Diego Boneta) have both moved to L.A. hoping to make it big with their singing talent. Instead they wind up working at sleazy rock bar the Bourbon Room run by Dennis Dupree's (Alec Baldwin) and his perpetually wasted assistant Lonny (Russell Brand). The club has money problems, but a farewell concert from arena rockers Arsenal prior to their singer Stacie Jaxx (Tom Cruise) going solo could solve everything. Sherrie and Drew are attracted to each other, but a series of typical movie misunderstandings comes between them. As a result, Sherrie winds up working as a stripper at the Venus Club, owned by Justice Charlier (Mary J. Blige). Perhaps even more degrading, Drew gets groomed for success as part of a boy band put together by Jaxx' oily manager Paul Gill (Paul Giamatti). 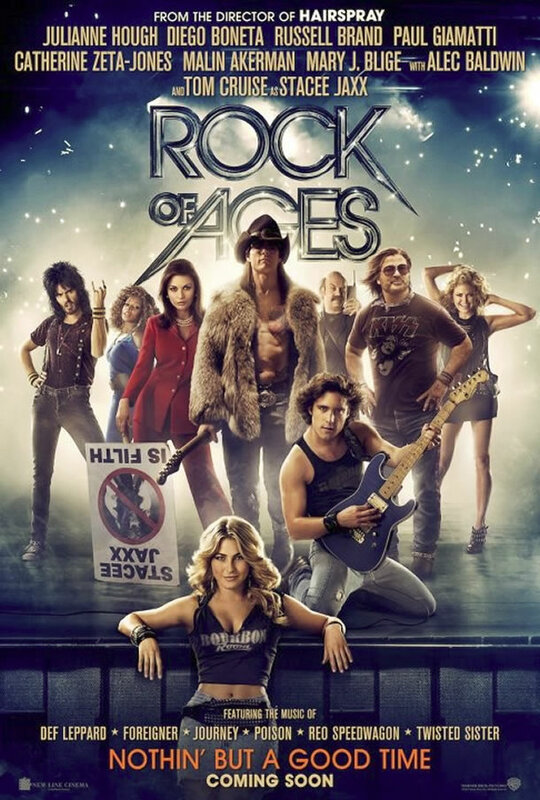 Meanwhile, Mayor Whitmore (Cranston) is running for reelection, and his wife (Catherine Zeta-Jones) is using it as a platform to protest against rock music in general, and Stacie Jaxx in particular. Can the power of music make everything right? What do you think. ROCK OF AGES does a pretty good job depicting the fantasy that glam metal sold to its audience, and even a little of the darker reality. Not too much darkness, though. The narrative could use a little pruning, and the device of blending two (or more) songs together gets used a few times too many. The two leads are decent, but it's Cruise who really impresses here, as he does every so often in his career just to prove he can before going back to making MISSION:IMPOSSIBLE sequels and jumping on couches. But seriously, he's good here, and his singing voice is fantastic. Of course the plot is silly and contrived; it's a musical. But whatever faults it may possess, like the bands it draws inspiration from, ROCK OF AGES knows how to give an audience a good time. 3 out of 4 stars.